Dr. Yoshihide Hagiwara, a world-renowned scientist, inventor, and entrepreneur, graduated from Kumamoto University in Japan as a research pharmacologist. Early in his career, Dr. Hagiwara developed several highly successful drug formulas, becoming the owner of a leading Japanese pharmaceutical company. 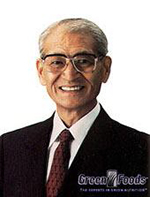 As Dr. Hagiwara grew aware of the problems caused by the many chemicals used in modern medicine, he vowed to devote his life to a natural nutritional approach to health. After years of research on over 200 types of plants, including fruits, vegetables, grasses, and herbs, he found that "young barley grass is one of the most nutritionally balanced foods in nature." In order to capture and protect the delicate nutrients and enzymes in freshly harvested young barley grass, he developed a unique juice extraction and spray-dry process that earned him Japan's prestigious Science and Technology Award. This process makes possible our powdered, nutrient-rich Green Magma,® first developed in Japan in 1969. Green Magma barley grass powders products are derived from the essence of green barley, certified organic, and are made with the original formula that loyal customers have come to expect for over 20 years. This is the original formula which was developed by the world renowned Dr. Yoshihide Hagiwara, M.D. Green Magma grown in pesticides and chemical-free fertile plain land and is proceeds with the California Organic Foods Act of 1990, one of the world highest standards. Green Magma is harvested when the young Barley Grass is at its nutritional peak. Within 4 hours of harvesting the young Barley leaves are cleaned, juiced, concentrated, spray-dried and packaged. Barley Grass is very prone to oxidation and heat which will destroy all it nutrition values. To preserve and protect the fragile nutrients and enzymes from oxidation, a sophisticated processing technique is used where first the barley grass is turns into juice under a constant low temperature and the juice is immediately spray-dried in just 3 seconds to a fine powder, stabilizing the nutrients at their maximum strength. This gentle extraction technique separates the liquid part of the plant from the insoluble fiber (plant fiber that cannot be digested by human). This process unlocks the nutrients from indigestible fiber of ground leaves to produce a product that is fully soluble and instantly absorbed by our body. The Barley juice powder is then immediately hermetically sealed into vacuum packed oxygen and light protective barrier bags and placed in cold storage with all the bio-activity intact. On average 30 kilograms of the barley grass juice is concentrated down to one kilo gram of the synergised® organic barley grass juice powder.